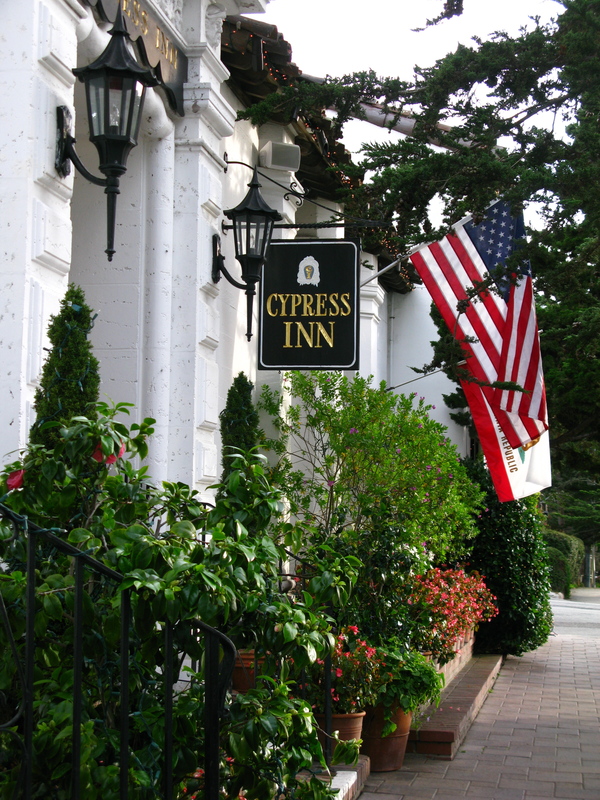 Not far from our Carmel home is the beautiful Cypress Inn. 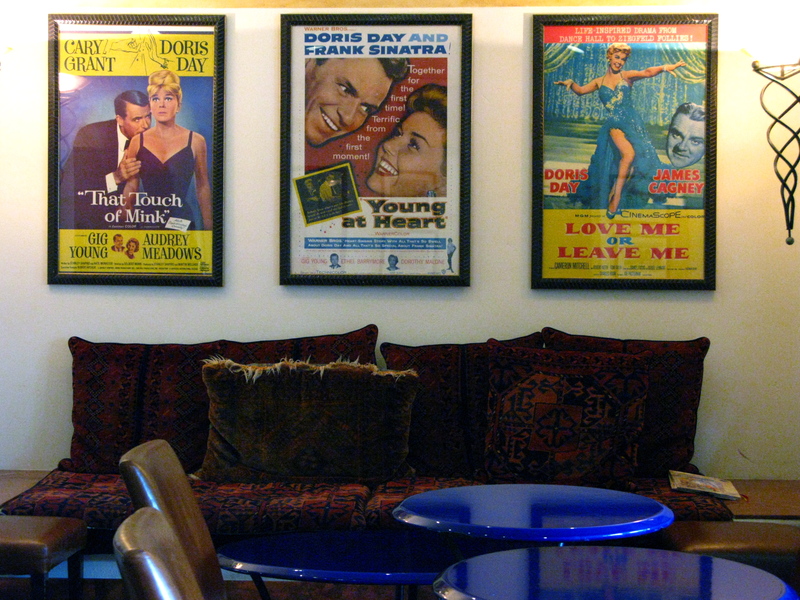 This hotel has been owned for over 20 years by Doris Day and Dennis LeVett. Not surprisingly, it is so dog friendly that if you don’t love dogs you mightn’t want to stay here. Ms Day is well known for her Doris Day Animal Foundation http://www.ddaf.org. 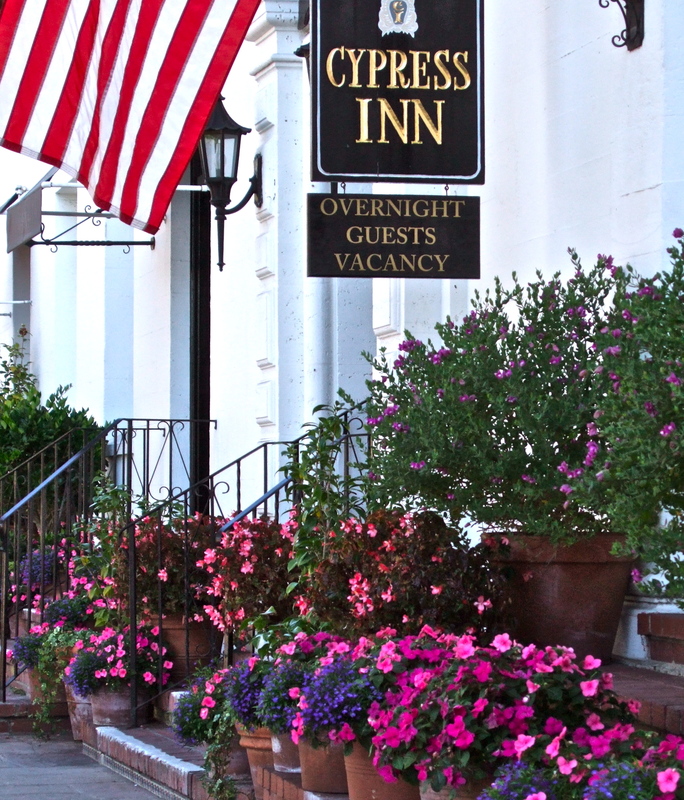 The Cypress Inn has a rich history. In 1906, Sidney J. Yard, an artist known for painting watercolors in the English manner, built the first art studio in Carmel on this site. The space was later used by another famous artist Miss DeNele Morgan. In 1929 Dr. Rudolf Kocher, working with one of Carmel’s premier contractors Hugh Comstock, constructed the present Mediterranean style building. It was originally known as the Hotel La Ribera and has been an Historic landmark hotel ever since. 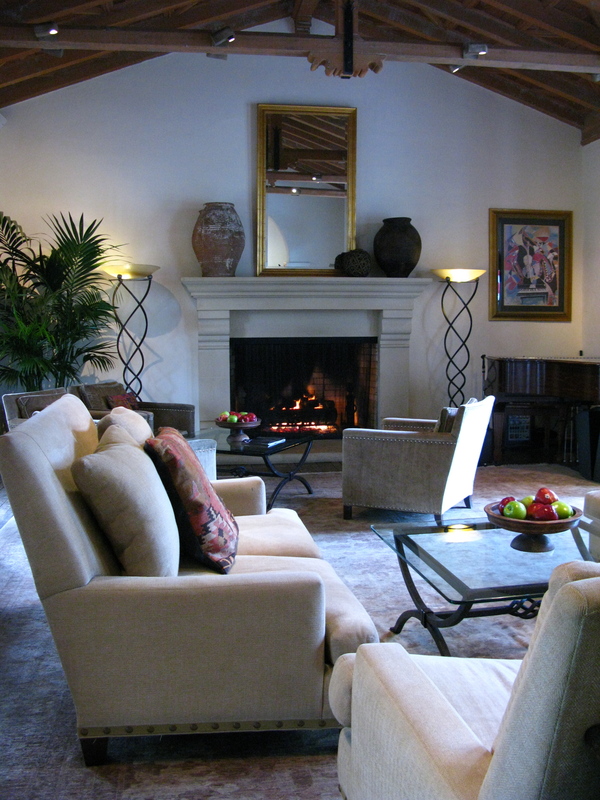 It’s a charming hotel with lovely rooms and a great piano bar. But it’s main attraction is all the fun that goes on during “yappy hour” when guests, residents of Carmel and their dogs gather to have cocktails and socialize. We have witnessed a few “bar fights” but things are usually under control. 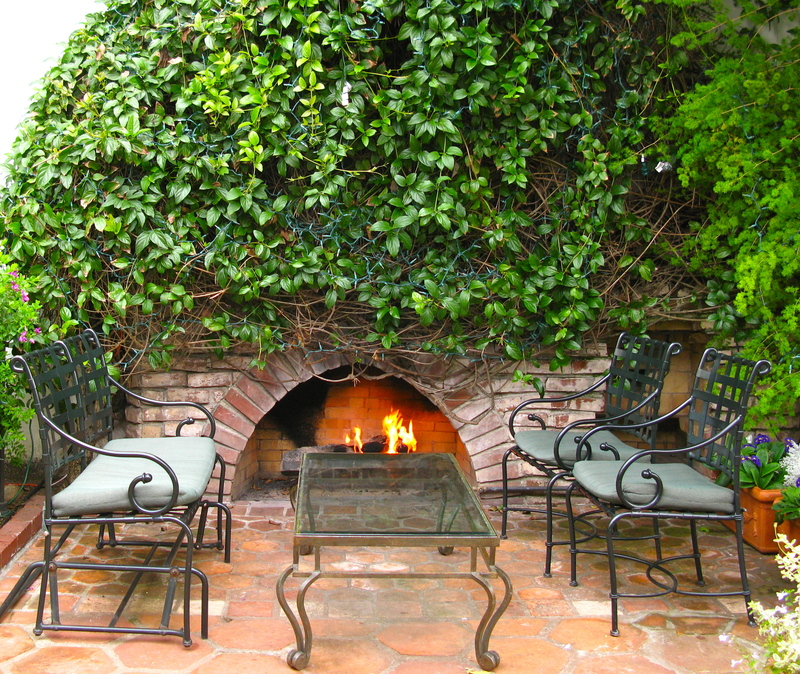 and the colorful garden courtyard warmed by its own fireplace are all places for people to hang out with their pets. 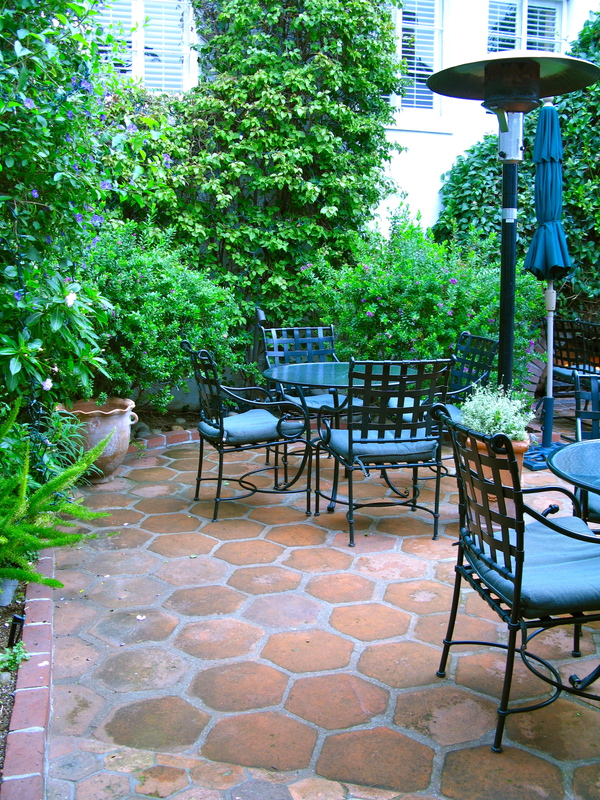 The courtyard even has a spot to wash your pet when you come back from the beach. The hotel was recently remodeled and serves wonderful tapas. We love to go in for a drink and a bite ( no pun intended). The ambiance is charming. Pets are not allowed in the bar itself. Afternoon tea is available and includes tea sandwiches, homemade scones with jam and cream, cookies and a large selection of teas. I have yet to persuade my husband to partake of “tea”. The Inn has 44 rooms and several suits. We have friends who have been staying there for years. They love the continental breakfast, cozy bathrobes, luxury bath products and complimentary cream sherry while their dog enjoys the soft blanket, dog bowl and treats. When we last visited Carmel, I was surprised by some new artwork on a courtyard wall. I did a double-take. 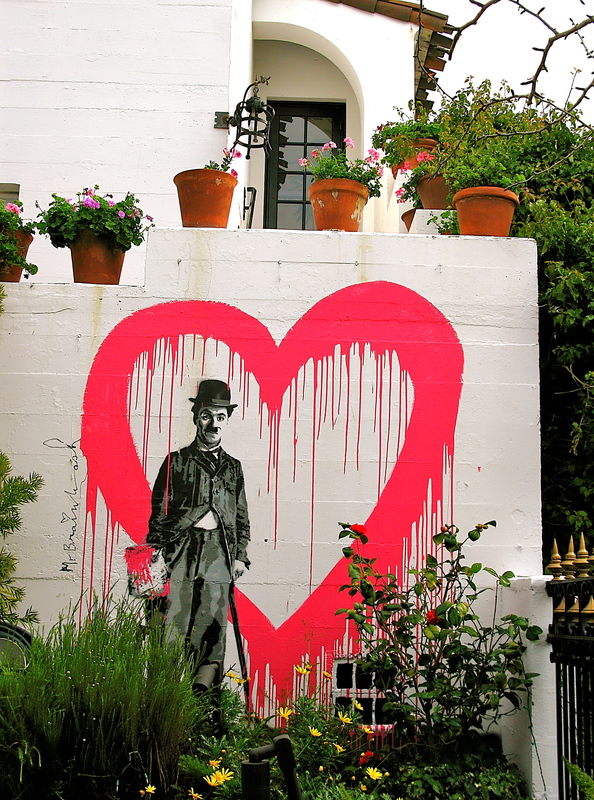 It appeared that Charlie Chaplin had run amok with a can of paint. This work is signed by Mr. Brainwash. At the hotel desk, I learned that this was painted by a famous street artist Thierry Guetta—his real name— French-born Los Angeleno who began as a documentary filmmaker, working closely with street artists, including the infamous Banksy. Over time, he became a street artist himself: the splendidly named Mr. Brainwash. During last year’s Carmel Art Festival , he came to town and painted several of the buildings. Albert Einstein is somewhere in town. I will search him out. 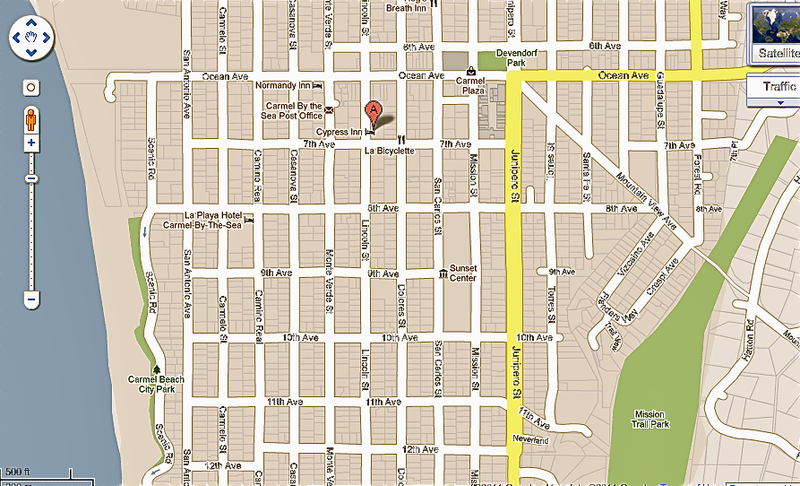 If you own a Poodle, mixed poodle, labradoodle or goldendoodle you might want to mark Satuday, October 1, 2011 down as a good time to visit Carmel and stay at the Cypress Inn. This is POODLE DAY !!! Where else, but in Carmel ,could one attend a POODLE COCKTAIL PARTY? Love your new blog. I love Carmel. I stayed one time at a charming inn with little cottages around a green lawn rooms with small almost elf like but so cute it was right up the street from main area. So storybook like and charming. I will add your blog to my favs list on my blog! Welcome to blogland! Rofl!!! The Airedale parties in the dog park never run to cocktails! Would it be possible to post a map and put in a pin for each new post? It would be fun to get a feel for just where things are. Good Idea, Jeanette. I will try to figure that out. There. How is that. Great idea I will go back and add some other maps. 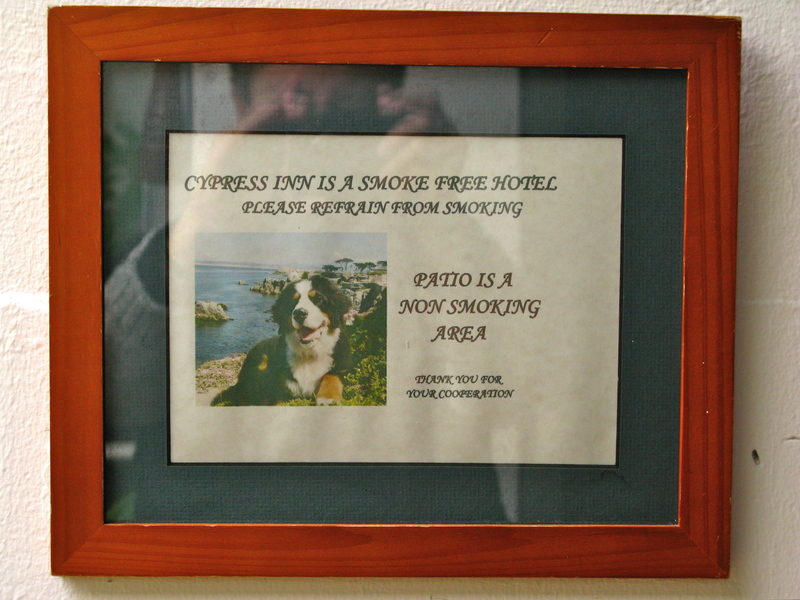 The Cypress is lovely, but not the place for those with alleries or asthma. I love your site. I feel like I’m back in Carmel every time I click over here. Again, thank you for doing this. The Chamber of Commerce should be paying you! Can you become homesick for somewhere you have never lived? I think I have. I have traveled to Carmel by the Sea twice and I miss everything about it. Your blogs are rich and warm and make me miss that beautiful part of our country even more. Thank you for sharing and I look forward to reading more, from afar, trapped in the heartland. Holy smokes…I just found your blog through Mod Vintage Life. I love Carmel by the Sea! I have visited there three times and decided if ever fall into a good deal of money, I would buy a wonderful cottage. Please keep posting! LOVE YOUR BLOG!